At a time when few people could afford to take more than a few black and white snapshots, Pete Wilcox was honing his photographic skills using a Kodak Instamatic camera and unusually for the time colour film. These photographs date from the mid 1960s and represent a very valuable photographic record of a bygone era. The MIAC is delighted to have been given permission to reproduce these valuable images. 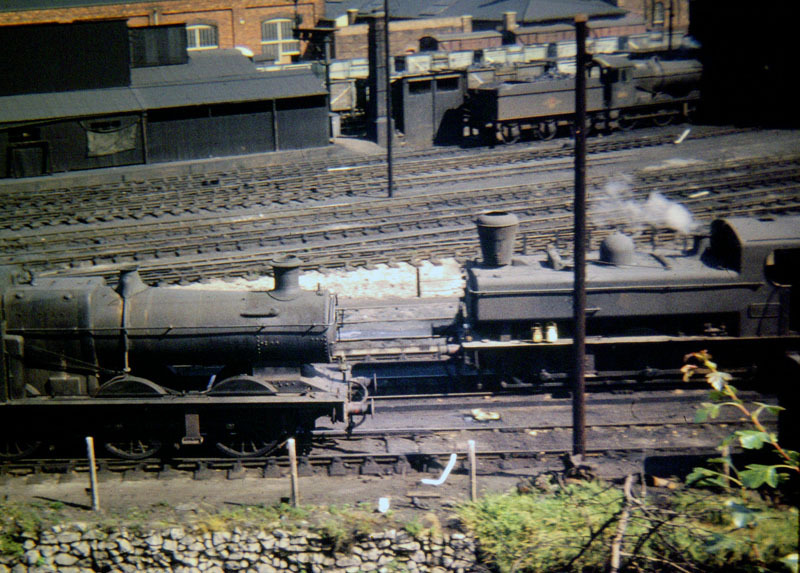 The locomotive on the left awaiting coaling is Old Oak Common (81A) based 'Castle' class 4-6-0 No.7032 'Denbigh Castle'. No.7032 was one of the last 'Castles' to be built and also the fourth one to carry the 'Denbigh Castle' plates. These had originated on No.5049 but removed when that locomotive became 'Earl of Plymouth'. 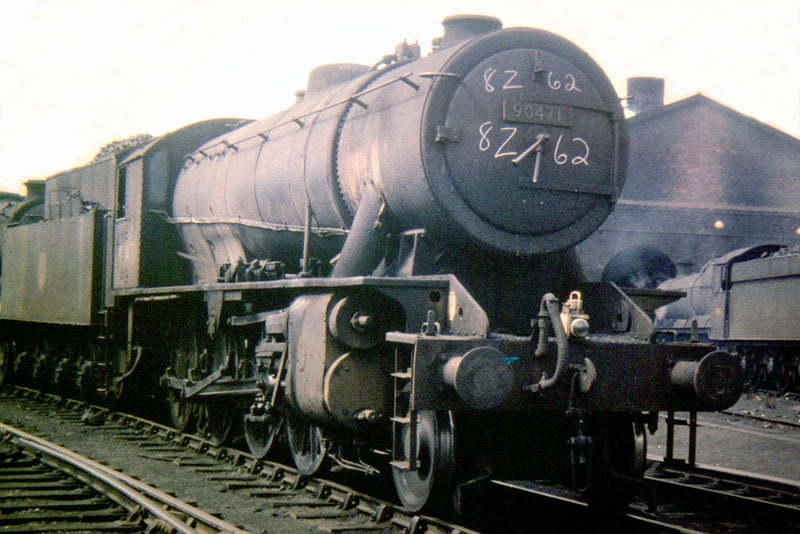 'Denbigh Castle's' second incarnation was on No.5074 until that engine was renamed 'Hampden'. It re-emerged on No.7001 but was cast aside again in favour of 'Sir James Milne'. This photograph taken on 25th March 1964, fully nine months after the London express trains had been officially dieselised. However at this time the Western Region of British Railways was planning a 'Farewell to the Castle's' special train and No.7032 was one of those trailed on the 9:15am Paddington to Worcester train. Eventually No.7032 was selected as a standby locomotive but was not used on the special train which ran from London to Plymouth on 9th May 1964. On the right is an engine that tried to get away (from the scrap merchant) as every time the official's at Swindon ordered it to be withdrawn they found another engine had been withdrawn in its place. 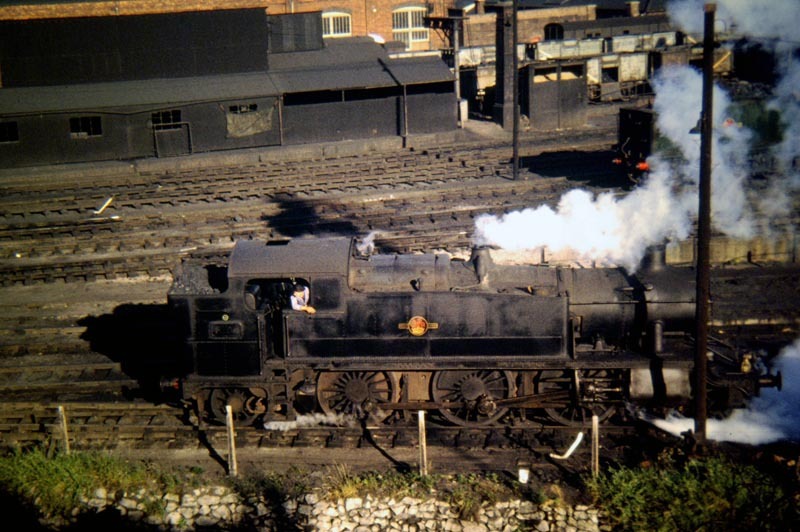 No.5152 is clearly in steam and in good external condition five months after its withdrawal date! 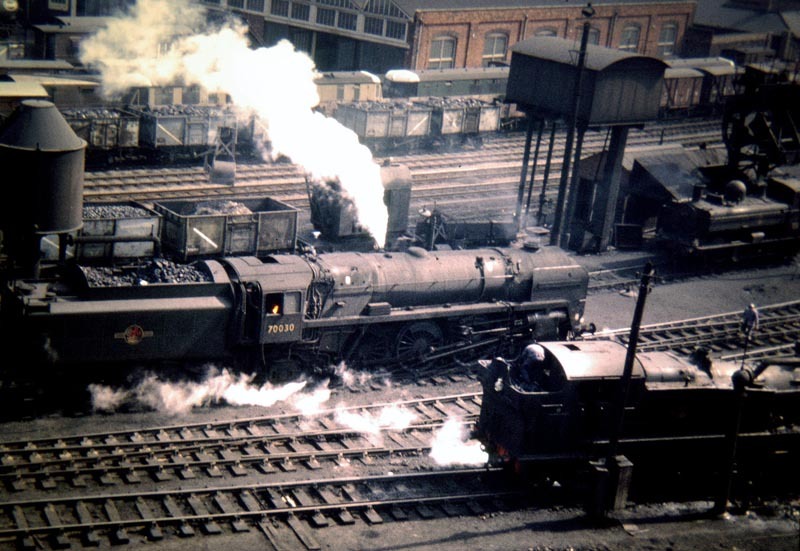 Coincidentally 25th March 1964 is also the last date on which the MIAC recorded this loco in steam at Worcester as shortly afterwards it was indeed sent for scrap. It is also worth noting that alongside the repair shops in the background are three withdrawn single car railcars which include W20W on the left. The same three railcars can be seen in this photograph which was taken on 14th April 1964 and has as its main subject the visiting BR Standard 'Britannia' class 4-6-0 No.70030 'William Wordsworth'. On the right hand side of the photograph are an 0-6-0 Pannier Tank and a 2-6-2 Prairie tank. Another picture of No.70030 (possibly even taken on the same day?) appears here. This is '8100' class 2-6-2 tank No.8104 of Worcester shed in remarkably good external condition and seen being reversed away from the boiler washout shed on 29th June 1964. Seen from the same viewpoint on 'Railway Walk' is the instantly recognisable spark arrestor chimney on Worcester based 0-6-0 Pannier Tank No.1661. 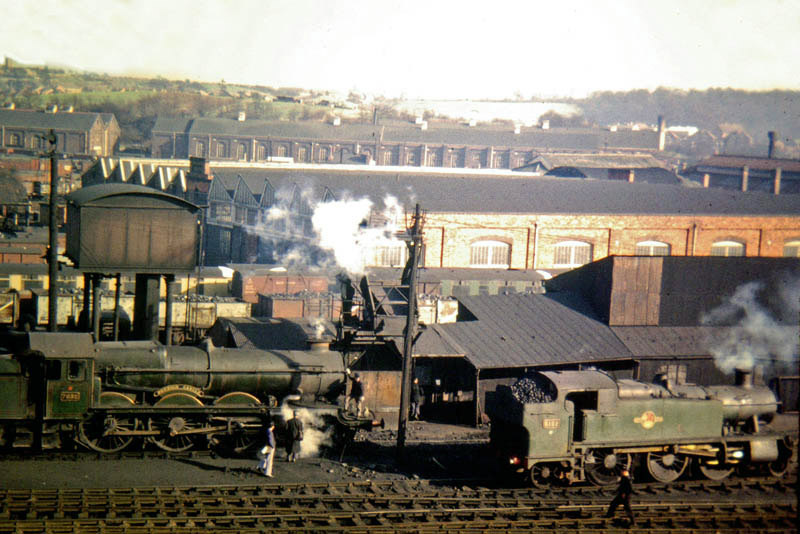 On the left of the photograph is a Collect '2251' class -0-6-0 tender engine whilst standing in the shadow of the running shed is another engine of the same class. This amazing photograph is typical of the activity that could be seen on Worcester engine sheds on a typical day during the steam age. It features two ex-GWR 'Castle' class 4-6-0 express passengers locomotives which were based at Worcester for use on express services to London. In the foreground is No.5054 'Earl of Ducie' which is standing in front of the boiler washout shed. The other 'Castle' is No.7022 'Hereford Castle'. Both of these locomotives were late arrivals to Worcester in November 1963, two months after the official end of steam on the London services and both survived the cull of Western Region steam in September 1964 when they were transferred to Gloucester. 'Earl of Ducie' was a railtour favourite and in such good condition that it was one of the locomotives used on the 'Farewell to the Castles' high speed run to Plymouth on 9th May 1964. Also on shed in this photograph is a 'Hall' class 4-6-0 whilst passing on the main line is an ex-LMSR 4-6-0. This photograph was taken on 4th July 1964.. These are more photographs of both of these 'Castles' on this site - see loco index for links. Although they were not based at Worcester the large fleet of locomotives built by private manufacturers for the Ministry of Supply during World War Two and popularly known as 'Austeritys' were regular visitors to Worcester and were characterised by their familiar clanking noises. Although intended only for short term use these 2-10-0's were liked by railwaymen with some depots such as Wakefield keeping them in immaculate external condition. During World War Two this locomotive carried was No.78667 and it became LNER's No.3150 when bought by that company after the war. In the BR renumbering scheme it then became No.90471 and is in less than pristine condition having at one time apparently been used on special train No.8Z62. Although it does not carry a shed plate the engine was based at Canklow (41D) shed in Sheffield. 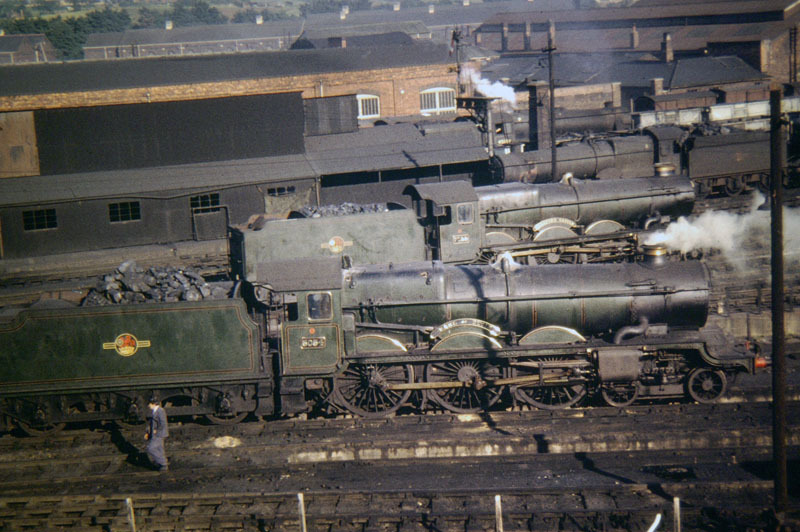 In the background minus name and numberplates in a grimy 'Hall' class 4-6-0. This picture was taken on 7th June 1965. 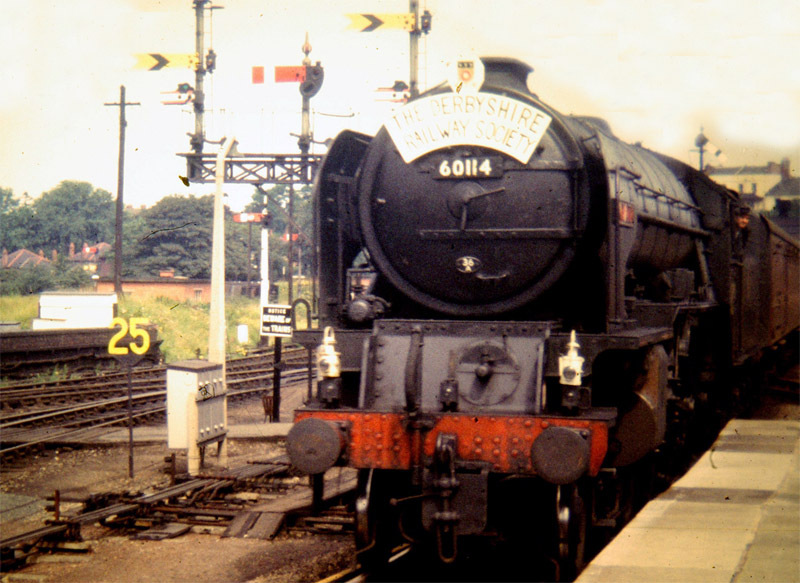 The arrival of No.60114 (of Doncaster Shed) on a Derbyshire Railway Society railtour that had originated in Sheffield was the first known visit by a Peppercorn designed 'A1' to Worcester. No.60114 worked only as far as Worcester where it was replaced by Worcester based 'Castle' class 4-6-0 No.5054 'Earl of Ducie' for the second leg of the tour to Hereford, Pontypool Road and Cardiff. As was to be expected from a Worcester engine the 'Castle' performed faultlessly but the ex-LNER Pacific was failed at Worcester and did not work the return leg. This photograph shows the special which had travelled via the former Birmingham & Gloucester Railway and down the Lickey Incline before using the former Oxford, Worcester & Wolverhampton Railway built spur line to Droitwich Spa and on to Worcester Shrub Hill Station. As recounted by Adrian Booth No.60114 did not work the train back to Sheffield and its place was taken by Saltley based Stanier Class 5 4-6-0 No.45263. After lengthy repairs the 'A1' headed back to Yorkshire on 7th August 1964 with Worcester's driver Don Edwards and fireman Howard Griffiths at the controls for the journey from Worcester Shrub Hill to Birmingham New Street.